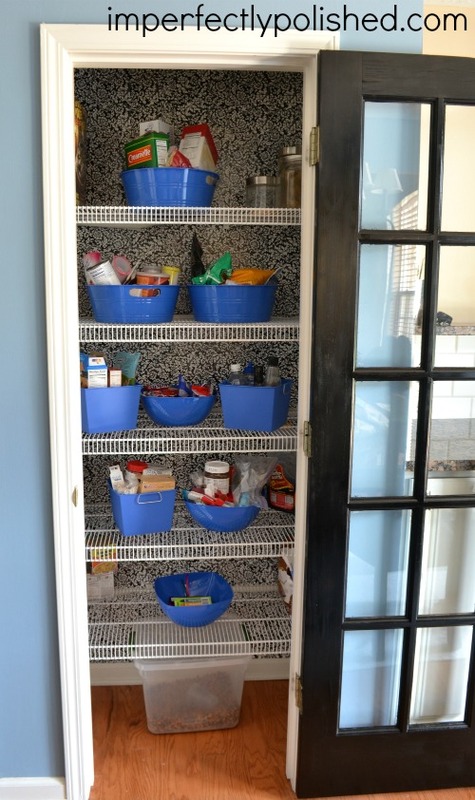 I’m back today with my first tutorial from the impromptu pantry makeover. 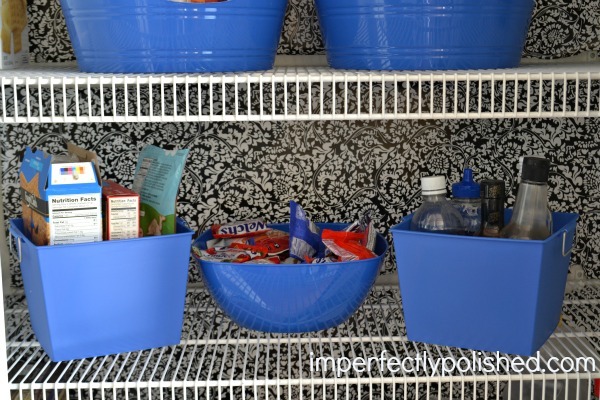 I was out running a few errands the day we decided we were going to revamp the pantry and as I was walking through Home Depot, waiting for a paint sample, I decided to wander over to their Contact paper section and see what they had to offer. For some reason, it popped into my head that it could make a great back drop for our pretty door. I didn’t find any that I loved at HD, so I stopped by Target on my way home and found this pretty black and white paper. Perfect. For $5, if it didn’t work for some reason, we wouldn’t be at much of a loss so I bought a roll and decided to give a try. I’m so glad I did because it adds so much to our new door. Rather than taking out all of our wire shelves, I decided to cut a piece of contact paper to fit in between each one. I measured the area for each shelf space and laid it out to cut. 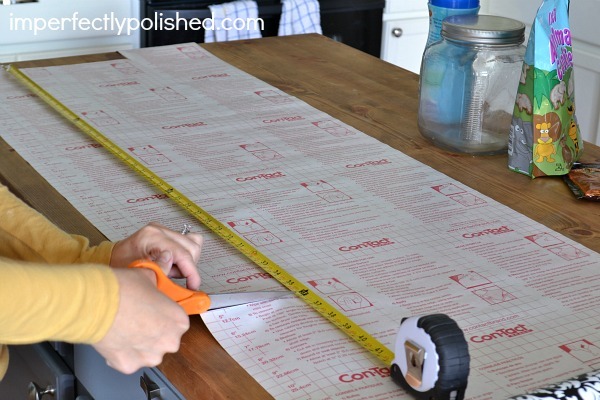 The great thing about Contact paper is that is has grid lines, which makes it easier to cut a straight line. Then I had to stick it up. Contact paper is already sticky, but after putting up the first two sections, I realized the corners may need a little extra adhesion to stay so I added glue dots. I think I put about 4 across the top of each section. We’ve had it up for a couple of weeks now and that seems to be working like a charm. So far so good. Wire shelves have little tabs where they attach to the wall so as I stuck the paper up, I went through with a utility knife and cut out around them. Once you add baskets and food, you don’t even notice the little notches. 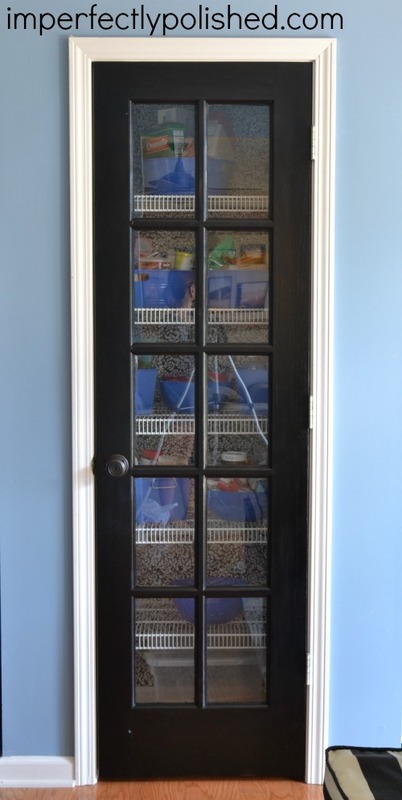 This method would also work great to back a bookshelf or add some “wallpaper” in an apartment or dorm room where you wouldn’t want to put up anything permanent that could hurt the walls. I love how it turned out! What do you think? 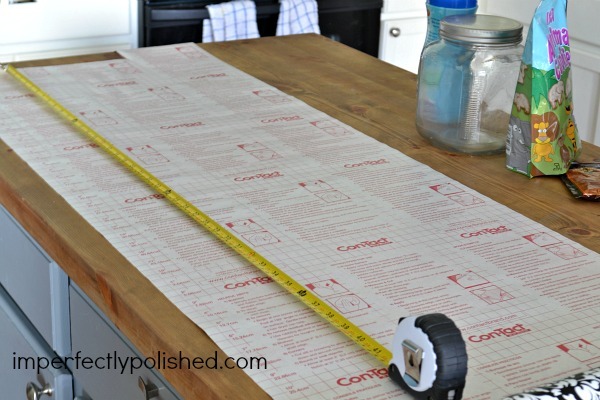 Have you ever used Contact paper on your walls? This project is fab. Seriously. The cute paper is the contact paper! They make contact paper with all sorts of fun patterns and textures so its already sticky. Just cut and peel the back off! « It’s Officially the Holiday Season!